As our New Caledonia adventures draw to a close, I was wondering how best to describe our range of experiences. 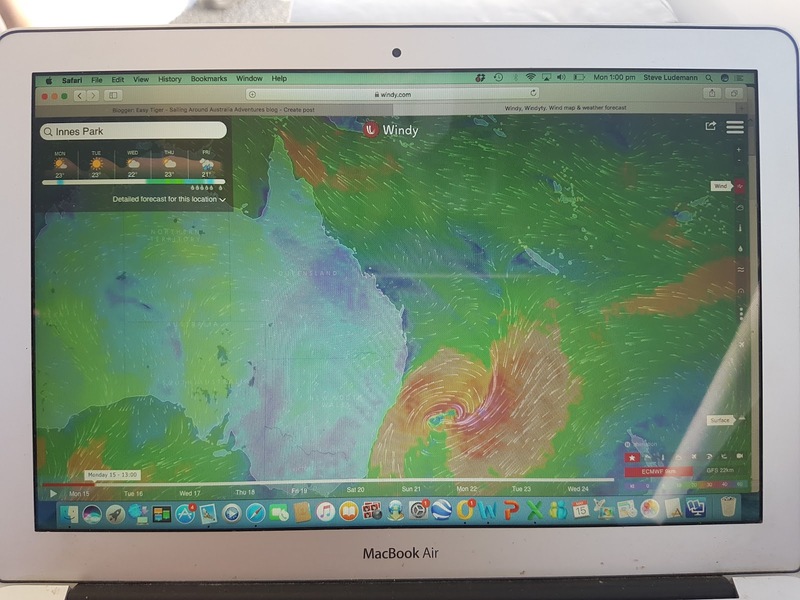 Those who have looked at our Easy Tiger Sailing around Australia blog site will see that our track over the past three months looks like a blob of Spaghetti dobbed on the southwest corner of New Caledonia. While it doesn’t look like we have ventured very far, I must say that this is because the huge lagoon formed by the 2nd largest barrier reef in the world is so full of life, colour and beauty that we just simply haven’t had time to venture too far out of this wonderland. There are many islands in this lagoon. Most are small, flat and have a few metres of beach. So going for a long walk involves two or three laps around the island. The appeal of these small islands is that they all have extensive reefs surrounding them, that are truly beautiful to snorkel and dive in and around. The bigger islands generally consist of steep hills. These are mostly topped with either a navigational light or a lighthouse. Exploring these “peaks and troughs” of this place has been a delight. By that I mean that we have hiked to the top of a few of the step hills and we have snorkel dived the reefs of the islands. Our first venture up to a peak, was during the time we were anchored in bay Carenage at the end of the Bay de Prony. After a wild dinghy ride down the bay, we trekked to Prony village. Luckily we started with the easiest trek as our boat legs hadn’t done much walking for a few months and were certainly burning after scaling the long hill. The second hike up a hill was at the Isle Casy. We should have been lead on that adventure by the islands' sole inhabitant, a dog called Moose, but it seemed he was having a day off. A visit to Isle Mato when it was too windy to snorkel the reef there saw us tackle the very steep climb to the summit. I say it was a climb because we were on all fours at times getting up as well as coming down. Except for when Amanda saw a snake. Then there were no limbs at all touching the ground for a second or two. Then when we were in Anse MAjic, some one suggested we go up to the Cape Ndua lighthouse and take in the view. While not as steep as isle Mato, it was considerably further, along the very red dirt tracks. The view from up there was absolutely spectacular. The bluest of ocean, dotted with dark green islands and light green submerged reef systems with a backdrop of dark red hillsides made every angle postcard material. During our second visit to Isle de Pins, we tackled the walk to Pic Nga. That one had the steep sections like Isle MAto and was even further than The Cape Ndua Lighthouse “stroll”. We were all huffing and puffing and doubting we would make it to the top before we reached a quarter of the way up. Fortunately we all made it to the top albeit breathlessly. That didn’t help much because the views from Pic Nga over Kuto bay were breathtaking. A cruise ship in the bay, the fast ferry at the dock and our catamarans sitting in the turquoise water followed by the many pine trees standing tall on the rolling hills makes a vista worth the tired legs, blisters and sore joints. On the other end of the altitude scale has been the snorkeling. Highlights of this activity include the coral around the drop offs and chasms at Gadji, the numerous colourful clown fish (or nemos) at Isle Uaa, the turtles and other creatures in abundance in the sanctuary of Signal Island and the big fish lazing under our boats at Amedee. Great Snorkelling spot out front of the resort at Isle Maitre too. There may not have been a circumnavigation of the main island Grand Terre. There wasn’t much time spent in the capital in Noumea and the East Coast remains unvisited by us, but what we have done is explore the lagoon area top to bottom. All of us that have been here agree that it will remain on our bucket list to return to New Caledonia hopefully in a couple of years. Perhaps then we may venture further, but we all say that would need an extended visa. Till then we know that got the most out of our visits to the peaks and troughs of New Caledonia’s lagoon. Over the 4 years we have been sailing aboard Easy Tiger, we are often about the best place we have been. Of course there are many variables that dictate how we rate the many places we have been. For instance, if the weather didn’t suit, or the anchorage was crowded, or we were unable to stay long enough to get the feel of a place are factors that may influence our “rating” opposed to others who may have been there at the perfect time. There are a few spots though that are really nice in spite of the weather conditions and where it doesn’t matter how many other boats are there. Gadji, at the northeast end of Ilse of Pines in New Caledonia, would be one of these. The two anchorages of Gadji are simply gorgeous. One is the outer, where you don’t have to go across the reef, the other is the inner anchorage where you enter at high tide into a huge pool of crystal water that ranges from only a metre to around 3 metres deep. This clarity of the water with it’s bright blue tinge gives you the impression that you are anchoring in a swimming pool. The inner anchorage is surrounded by islands. These islands create a pond like area with a diameter of maybe three or four hundred metres. Most of these islands range in size from a suburban front yard to a few hectares on the largest. Many are just large volcanic rocks with that have been undercut over years by the seawater eating away underneath, creating a “mushroom” shape. Curiously, most of these islands, big and small, have dense bush growing out the top. How such a variety of shrubs, bushes and even tall straight pine trees exist on these lumps of rock is amazing. In the water, there are many “clumps” of coral. In the “swimming pool” inside anchorage there are spots of branch like coral that ranges in colour from bright blue to deep purple. Then in the passes between the islands there is fawn coloured brain coral, and lime green fuzzy coral. On the ocean side of the passes between the islands there is plate coral. This seems to grow laterally and as flat as a plate giving great opportunities to the fish to find protection underneath. The fish life around these corals is spectacular. From small bright green or electric blue damsel fish, various clown fish (nemos) to yellow and black striped angel fish. Added to this are bright green or maroon coloured parrot fish, plus turtles and sting rays all together are an absolute delight to watch while floating among them. Perhaps one of the best bits about Gadji is that you can really only get here by boat. There is no accommodation here, no resort, no swim up bar. The entry and exit points are pretty shallow, so there are no big boats carrying hundreds of people, its just us cruising sailors and couple of local dive boats that get to enjoy it in all it’s glory. Several of the larger islands have small beaches. So the norm for us is to have a bonfire on one of these beaches every other night, where all the sailors get together to swap stories. Inevitably the conversation seems to come around to how gorgeous Gadji is. Windsurfing in the "swimming pool"
A group of people gathered at the Gold Coast in Australia with the common aim of setting off on a sailing adventure to New Caledonia and Vanuatu. They had been gathered together by one man who had sailed this path quite a few times before, and wanted to share his knowledge and love of the South Pacific with others. In the middle of May 2017, 40 people had assembled aboard their various vessels. Quite like all the ingredients put together to make a really good fruit salad. While these folk all had one thing in common (they were looking for an overseas sailing adventure), that is pretty much where the common thread ended and the differences began. The first thing that set the apples apart from the banana's was the group itself. There was the "senior" brigade (people in their seventies) and then a mixture of age groups right down to gen y's in their 20's. Into this rally salad there were passionfruit who had a wealth of sailing experience including crossing the South Pacific several times, to the pineapples for whom this would be their first time more than a few miles from the coast of Australia. The peaches and grapes were defined by the various types of vessels that the people participating in the rally were preparing to sail the 800nm journey. There were 10 catamarans, 9 yachts (monohulls) and a trimaran. Probably the greatest mix of all, was the differing backgrounds of the fruits. From Farmers to Engineers, Teachers to Computer Programmers, Business Owners to Retired Public Servants, this group is a huge cross section of the general population. After five, six or in some cases seven days at sea, the rally salad was thoroughly mixed together by the sense of achievement, having arrived in Noumea. Nowhere was this more evident than at the "arrival party" where the whole rally salad was served up, with the help of a French rock n roll band who cranked their amps right up as forty or so sailors with a huge sense of achievement let their hair right down. Since then the salad has got off in many different pieces. Some headed north to explore, others went south to see what they could see. But each time their paths cross, we can hear or see the genuine camaraderie between apples, passion fruit, bananas and strawberries. Wether its helping out with a technical boat problem, recommending a marvellous anchorage or even just bragging about seeing a whale, the feeling of belonging to the group is evident. It was also very apparent when 8 boats and their crews came together, (most went out of their way), to help celebrate Leanne's birthday. Like the master chef's say, it's is the blend and the mixing of the distinct flavours the make this salad work and for that my friends I am going to give you a 10. The Arrival Party was a hoot. Australia seems so far from anywhere. When you look at the map, it is 800 or so nautical miles to get to New Caledonia which is one of the closest "foreign" countries. I guess that’s why it seems such a great feat to sail there. I suppose, it’s no problem or hardly a challenge for Europeans, as different countries are so much closer, but for us it seemed quite daunting.To be lead by a fella that has done it eight or nine times before made it a lot less daunting, so we decided to include our boat in a “rally” of sailing boats. By the time the morning of departure came around, all the suggestion, discussion, debating, decision making, planning, organizing, financing, provisioning, learning, talking, shouting, frustration, effort and time that had gone into deciding to go, getting ready and preparation the down under go east rally brought us to the 23rd May 2017. Departure day. Were we ready? What had we forgotten? What could go wrong? How would we physically stand up to the task? All these and many more questions raced around in my head for most of the night before so when the time came I was actually already tired. At 6.00am there was plenty of nervous energy on board Easy Tiger as the crew milled around getting breakfast. For Leanne and I it was the culmination of our plans and dreams to go coupled with the anticipation of the 800nm passage that lay ahead, for our son Luke it was the excitement of showing his parents his skills and abilities and for Ian Sulley and Susan Rousalen it was just plain excitement. As Sue said "they didn't know what they didn't know, so didn't know what to expect". At 6.15am I did a final tour of the boat with Ian and Sue, reminding them where things like fire extinguishers were located, and which rope did what. I had prepared a list of things we expected to be done while on watch and went through the log book that we would keep for the journey, once more. 6.30am came around in the blink of an eye. Easy Tiger and crew anchored up, ready to assemble at the Seaway for an all in 7.00am departure. Many others came past us with their sails hoisted but we decided against hoisting our sails until we were out in the ocean. As we rounded the headland and straightened up, we were alongside our sailing family Eva and Brian on Zofia. Instant flashbacks to 3 and a half years ago when at 4.00am we departed Busselton WA next to each other, bound for what we thought then was a round Australia circumnavigation. Here we are now together departing on an international sailing adventure. Right on the knock of 7.o’clock am, the Gold Coast Seaway spewed forth 18 or so boats. Easy Tiger was in about the first half dozen spat out of the safety and quiet of the Broadwater, and dissolved into the Pacific Ocean. Although it was a very well organized and planned rally, it seemed that of the 18 or so boats, there were 18 or so courses taken. Leanne was watching on AIS and Marine traffic and was marvelling at the spread of boats to all eastern directions on the compass. We seemed to be in the middle again, heading due East. Some said this was a good strategy. Me, I was following closely the guy who had been there 9 times before. It seemed even at that early stage that waiting for the right weather had proved a master-stroke. We had a pretty flat sea except for a small rolling swell and just enough wind to make it worthwhile putting the sails up, while still having to keep 1 motor going. This was fortunate, as Easy Tiger, Leanne and I hadn’t sailed in the actual ocean for nearly two years. By mid afternoon on that first day, the rally had pretty much spread-eagled. We had lost site of most, save for half a dozen immediately around us. On the first evening, a side on swell had developed as we approached the first lot of ocean table mounts. These are underwater mountains where the sea depth changes rapidly from around 4000metres deep to say 500metres deep. Doesn’t sound much, but the change in depth causes currents that combine with wind to have Easy Tiger doing a kind of bumpy gallop rather than a smooth canter. The result of which saw all on board except Luke, produce burley and feed the fish. Sue was the first to succumb, followed by Ian. On dusk Leanne faded after trying to prepare curry for dinner. Last but not least I was unable to complete my shift after throwing the curry overboard so to speak. Thankfully, early morning day 2, saw us feeling quite a bit better. We had maintained contact with four other boats, which was comforting. Bossa Nova were one of these, with Neville’s dulcet tones providing encouragement over the radio. Ian says Neville sounds so good on the two-way he should work for the ABC! We had contact with the rally organizer on the vhf radio as well. Once we were well clear of the table mounts the sea flattened out. The wind came and went during the day, which meant more motoring. By the afternoon of Day 2 we had settled in to our 3hour rotation on the helm. Sue, even if she was still a little queasy, took to the helming and “on watch” tasks with aplomb. Luke showed his skills and proficiency by plotting our position on the paper charts and getting weather updates via satellite email from Metbob. 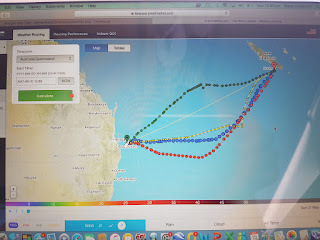 Metbob’s weather reports were compared with the Predict Wind Offshore app that I downloaded each day and from that we formed a plan for our route. That plan normally concluded with “follow the guy who’s been there 9 times before. At nightfall of Day 2 we had a weather forecast that said the winds could get upwards of 20knots. We decided to reef in the sails for the night. This means that we decrease the sail area to reduce the stress and strain on the rigging. Unfortunately this also means that the boat slows down, which meant that we lost contact with the other boats. Our third day at sea, the 25th of May, was my birthday. For me it started early as I completed my shift from 3 to 6 am. My son Luke wrote a nice message in the log book. It was just so nice to have him crewing on the boat. As I sat at the helm as dawn broke I reflected on my good fortune. To have a wonderful life partner who has supported my crazy ideas (such as buying a catamaran and sailing around Australia), my two children who continually amaze me and my great fortune to have been born in the wonderful country that is Australia. By midday on the 3rd day there was plenty of crazy stuff going on, onboard Easy Tiger. There was a bit of a competition to see who had the craziest music on their play list and even crazier dancing and wobbling about as those crazy tunes were blaring. Lot’s of nice birthday wishes came over the satellite communications. It was also nice to no that the crew onboard San Souci had scones with jam and cream in my honour. At night fall on the third day, there was a beautiful sunset. We had been maintaining a due East course until we received word from Metbob that we could alter course and start easing our way North. That was a nice feeling to be actually aiming at our destination. Also that night we were treated to a lightning show on our southern horizon, that went for most of the night. Friday, the 4th day at sea, we ran out of wind and fired up another motor. On my dawn shift I started to ponder many of life’s burning questions, like why are there so many there’s. Could we think of a better word for their, they’re or there. Another of those questions was “if they call them apartments, why are they all built together?”I think maybe I was getting a bit bored or maybe conditions were that nice for sailing along, that I had time to think a bit too much. Friday was probably the crew’s flattest day too. We did break out a few conversation type games and then resorted to the crossword and Sudoku puzzles in the Brisbane newspaper someone had brought on board. Saturday,The knowledge that we should arrive the next morning kept spirits pretty high. Predict Wind, Metbob and the guy who had been there nine times before, all showed a direct route to Amedee lighthouse that is only a handful of miles from Noumea. The wind was constant in direction but ranging from 5 to 15 knots. It kept teasing us to put up our screecher and when we did it would disappear, to have us pack the sail away again. The sixth day, Sunday, everyone was up and about a bit earlier than usual. There was a real buzz from the feeling of relief that today we would arrive. We made the way point to turn into the pass between two reefs at exactly high tide, 9.30am. We arrived with another rally participant, the lovely ketch Suena Azul. Luke got out his drone and after a really hairy take off was able to get some great pictures of us sailing past the Amedee lighthouse which marks the entry into the New Caledonia Lagoon, which is the second biggest barrier reef system in the world. At 11.30am we dropped our anchor in the Bay de Oliphant right next to the guy who has been here 9 times before, the organizer of the Down Under Go East Rally, John Hembrow. Their crew aboard Songlines were on board to wave, cheer and clap, as were Bossa Nova, Skellum and the Albatross. At midday the champers and beers were all cracked and the arrival celebration commenced. What a terrific experience we all had shared, what a relief that we made it safely, in good weather and had no trials or tribulations to report. How nice it was to be anchored in calm water and to watch the rest of the rally boats arrive one by one. So now if you ask me, what was the best part about sailing to New Caledonia from the Gold Coast of Australia? I would answer without any hesitation…arriving. The Amedee Lighthouse just inside the lagoon of New Caledonia is a welcome sight for tired eyes. EasyTiger about to drop anchor in a foreign country! Warm greeting from our mates on the Bossa Nova. Crewman Ian decided to hand deliver a couple of coldies. The number of boats in a small area in Noumea was overwhelming, particularly trying to find a spot to drop anchor. A warm welcome from the guy who's been here nine times before, John Hembrow on Songlines. So our bags are packed our crew are on board, Easy Tiger is full of fuel, water, essentials and there's enough food on board to feed the Chinese army. We just need the right weather and off we go on the Down Under Go East Rally to New Caledonia and Vanuatu. We are even techo-ed up after installing an Iridium Go satellite system. This will allow us to send and receive basic emails and sms, make brief phone calls and show our boat’s track in real time. Most importantly, the Iridium Go allows us to get weather reports from the Predict Wind Offshore app. This will be vital, not only during our trip but while we are in and around New Caledonia and Vanuatu. Fortunately the set up of the Iridium Go was reasonably straight forward, all seemed to be a bit easy actually until we tried to send and receive emails and messages to each other. It certainly helped to have Brain Oldfield (B2 from SV Zofia) nearby as his assistance was greatly appreciated. I did feel a bit of a dill though when Brian determined that our problem was the spelling of our password. Talking among the other Rally participants we heard that a lot of them were using a website called Windyty. This is a visual map of wind patterns and forecasts. It uses similar models of weather forecasting to Predict Wind but is a handy quick check, or if you like a second opinion. In anticipation of the journey, and with the availability of predict wind and Windyty, all the rally participants have become amateur weather forecasters. Each time we see each other we have been swapping possible weather windows, proposing departure dates and discussing the various weather models. The apprehension is building and the anxiety is high. Mainly because we are all ready to start this magnificent adventure, but also because many crew have flights booked and other things they need to do. This includes our son Luke who is due to fly from Noumea to Florida on the 8th June. So, if we leave later than the 28th May, we may be faced with finding new crew. The rally participants are all sent into a frenzy when the word of a possible weather window appears. Two boats have decided that due to their crew’s deadlines, they would brave the amateur weather routes and departed on Sunday of their own accord. We are all watching their track with much interest. 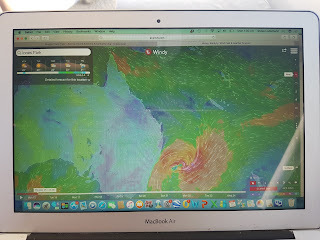 On top of Predict Wind and Windy, part of our fees and also part of our reason for joining the rally is that we get the services of a professional weather router. The weather routing is done by a New Zealand fellow named MET Bob. It is his advice that the Down Under Go East Rally organisers will take to let us know when the best time to head off, is. As we wait for updates from Metbob, the whispers of a potential departure send all the rally into a whirlwind of last minute preparations. Marina's are booked, fuel is topped up, provisions are purchased in anticipation of Metbob's go ahead. Then we wait. The email pings and Metbob's advice is... that conditions would be unsuitable in one or another part of the 1000kilometre journey. Then marina's are left and fuel and food is consumed as we mope around the Gold Coast Seaway anchorages. Easy Tiger is the Fusion 40 sailing catamaran that we became owners of in 2009. 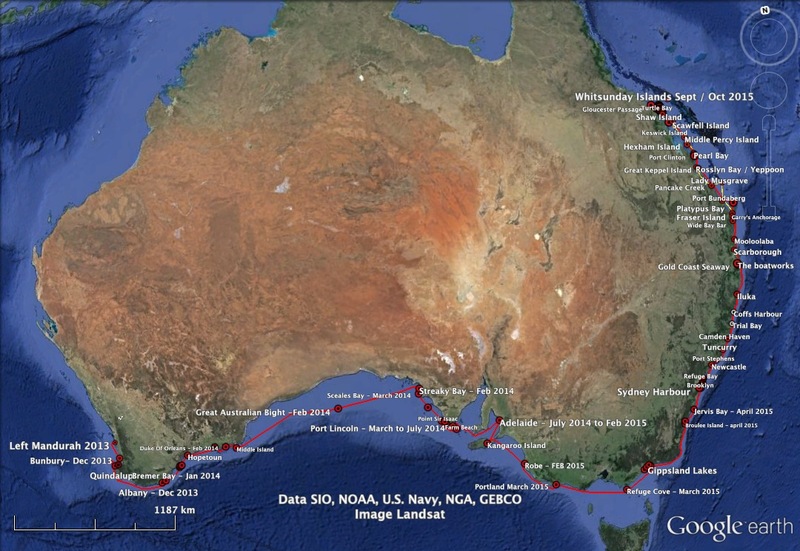 We left our home town, Bunbury Western Australia, on the 7th December 2013 for our Sailing Around Australia adventure. 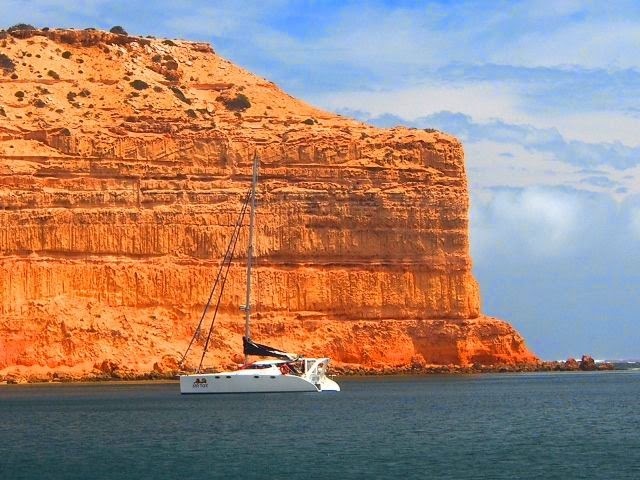 We travelled as far as Streaky Bay South Australia in the company of a Fountaine Pajot Lavezzi catamaran called Urchin and a Jeanneau 42ds called Zofia. Now we are travelling on our own. Hope you enjoy reading of our adventures. South Coast Western Australia Australia. Israelite Bay to Esperance Western Australia Australia. St Francis Island South Australia.